You can search for members from either the Contacts tab or from the Members tab using a simple keyword search or using an advanced search. Using the advanced search, you can combine multiple search criteria, and control whether any or all of the criteria needs to be met. 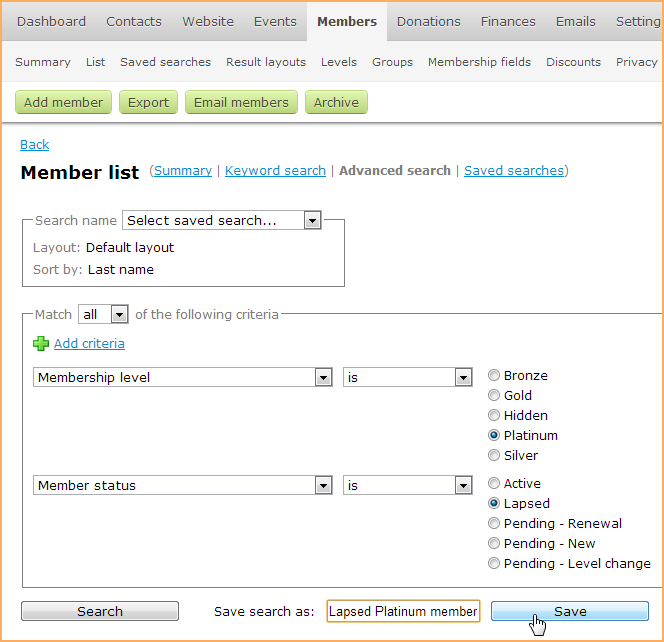 The advanced search within the Contacts module provides more options than within the Members module. Hover over the Members menu and select either the Summary or List option. Performing an advanced search involves assembling multiple search criteria. When you first visit the Advanced search screen, search criteria may already appear. To remove any of your search criteria, click remove to the right of the criteria. 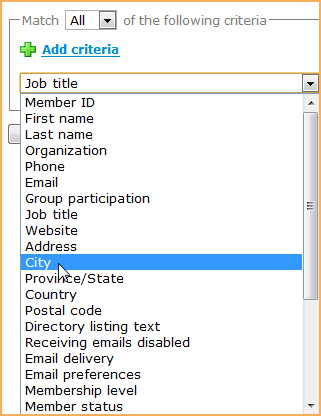 The first step in assembling search criteria is to select the fields you want to search by. You can select search fields one at a time or all at once. If search criteria already appear, you can select a different search field by clicking the first drop-down and selecting the field you want to search by. To add more search criteria, click Add criteria. From the window that appears, you can select as many different search fields as you like. You can search by just about any membership field (including all custom membership fields you create yourself and other system fields) except picture fields. The next step in assembling the search criteria is to choose a search operator. The search operator defines the relationship between the search field you just selected, and the search value you choose in the next step. For example, do you want the search to include records with the search value or exclude them? If you chose City as your search field and Miami as the field value, the search operator can determine whether you want to find contacts living in Miami (or Miami Beach), or whether you want to find all contacts not living in Miami (not Miami Beach). To choose the search operator, click the operator drop-down and choose an operator. For example, if you are searching for Miami, and you want to include Miami Beach as well as Miami as a match, you'd pick Contains. If you just want to match Miami and not Miami Beach, you'd pick Is. To search for cities that are not Miami, choose Does not contain (to exclude Miami Beach as well) or Is not (to not exclude Miami Beach). ...or selecting one or more values. After adding multiple search criteria, you must decide whether you want to match all the criteria or any of them. Click the Match drop-down and choose whether you want matching records to satisfy both criteria (All) or either criteria (Any). For those familiar with boolean searches, All is equivalent to the boolean operator AND, and Any is equivalent to OR. Once you have finished assembling your search criteria, click Search to perform the search. Matching records will be listed below. You can save your advanced search criteria so you can quickly and easily perform the same search again in the future. You can use saved searches to add multiple recipients when sending email blasts or scheduling event announcements, and to restrict the members listed in a member directory. After you have finished assembling your search criteria from the Advanced search screen, you can save your search criteria by entering a name for the search then clicking Save. The searches you save will be available for other administrators to use. You can control the layout of the search results – which columns are displayed and in what order – by selecting a result layout before running the search from the Saved searches screen. Instead of the standard search results, the matching records are displayed using the information you most want to see. 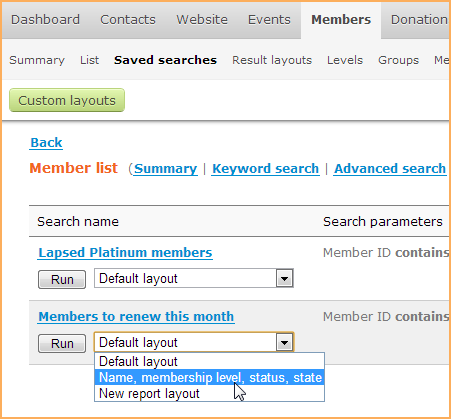 For instructions on creating search result layouts, see Advanced member search layouts. Once your search is saved, you can re-run it at any time. There are two ways you can run a saved search. From the Advanced search screen, you can click the drop down labelled Select saved search and choose a saved search from the list. Alternatively, you can click the Saved searches tab then click the Run button below the search you want to run. To modify a saved search, you display it within the Advanced search screen, modify the search criteria, then save the search using the same name or a different name. In either case, a new saved search will be created and the original search will remain unchanged. To delete a saved search, click the Delete link to the right of the saved search name on the Saved searches screen. Send an email blast to the entire search results by clicking the Email members button. Archive the current member list by clicking the Archive contacts in this list button. 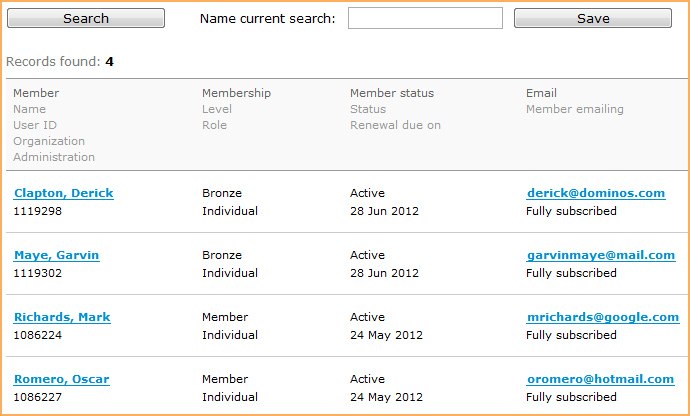 View individual member details by clicking on members within the list. From the Contact details screen, you can view and edit contact information, and use the Prev and Next button to browse through other records in the list.